Melissa holds a Bachelor of Music Therapy and a post-graduate diploma in Human Resources. Her experience spans work within geriatric cognitive impairments, palliative care, addiction counselling, and raising three children. Melissa has a family, a lover (her husband), a black lab, she hikes, makes pottery, and is a bit of a rebel. Currently, Melissa is in Buddhist Chaplaincy Training at Upaya Zen Centre, New Mexico under the study of Roshi Joan Halifax. Her current work explores a woman’s aspect in family life, 21st-century feminist perspective, cultural anxiety, addiction, consumption of information technology, time, and the greater impact on the future of our world. She is interested in how self-care and spiritual formation serve as a collective ‘we care’ – ultimately unfolding our greatest aspirations for parenting, partnership, human flourishing, community engagement, meaningful work, and influence on generations moving forward. 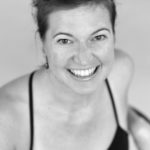 Melissa teaches yoga at MODO Yoga, leads yoga and meditation workshops, retreats, and is the Executive Director of ENSO Society (registered charity) in collaboration with amazing Buddhist Practitioners, Clinical Counsellors, Movement Specialists, and Wilderness Guides. Mindfulness-based programs for corporations and not-for-profit organizations. Weekly Meditation & Yoga Zen Inspired. I previously worked as an addiction counselor at a Women’s residential addiction recovery center in Toronto, currently lead a group program, and 1:1 visits at a Women’s recovery center in Kelowna British Columbia. My current program is a 2-hour, trauma-informed somatic movement therapy and contemplation session. During 1:1 sessions we go for long walks, get our bodies moving and explore the resilient patterns of nature. A large percentage of the women with whom I work have experienced sexual violence. I deeply love the Bodhisattva vows. I am humbled by the precepts, continue to work with my sometimes-anxious breathing, and I am making friends with my mind and better relationships with all of life. Everyone has the right to uncover their own wellspring of love and sense of wholeness in this world. This work is necessary because women continue to be sexually violated. Sexual violence history is prevalent among those who misuse substances. I’ve been in recovery from alcohol addiction for over 20 years. For me trauma-informed care means “coming alongside” a person’s process, introducing, inviting potential explorations, and opportunities to exercise choice and consent. This work is an offering, founded in love and free of expectation. Yoga Movement – exploring the inner landscape of our bodies through movement patterns and breath. Exercising ‘personally informed choice’ in every move we make. Locating parts of the body that are awake and active as well as the parts of our bodies that get forgotten and left behind. Inviting a full human experience into the world with compassion. Stillness – Through simple and flexible meditation exercises we explore deeper grooves of mental and physical patterns as they relate to each other both in the moments of stillness and how they might present in our day to day lives. Walking In Nature – Getting back into the body in the great outdoors. Moving beyond the inner landscape of our bodies to include the outer landscape of the world and our own deep interconnectedness with everything. Walking together supports fellowship in recovery. Just before we take our first step, we set an intention to observe the many ways nature experiences both suffering and joy. Look and see the patterns of resilience in nature! Creating conditions and spaces for safety first. Offering every exploration as an invitation.Creating a platform for individuals to exercise personal choice in everything we do. Additionally, there are Three Tenets (by Bernie Glassman) that I hold close to my heart and have taken as an ethical vow as a Buddhist Practitioner. Not Knowing – beginner’s mind in every moment. Bearing Witness – in every interaction. Compassionate – responding through action or inaction. All of my retreats have a sliding-scale option.